Easily the most impressive iPad accessory to be announced with the second-generation device is the Smart Cover – a clever cover with built-in magnets that clings to the side of the device to protect its screen while not in use. The Smart Cover doubles as a stand when it’s opened up. It’s available in both leather and polyurethane, and its most impressive feature is that is puts your iPad 2 to sleep when you close it, and wakes it up again when you open it. Naturally since its announcement third-party manufacturers have been designing and building their own iPad 2 covers and cases, all of which aim to be just as innovative and magnificent as Apple’s Smart Cover. Here is our roundup of the best third-party cases available right now for the iPad 2 – all of the cases below feature the same auto-wake magnetic feature included in the official Smart Cover. The biggest complaint about the Smart Cover is that it does not protect the back of the iPad from scratches. The biggest Compliment is that it doesn't add too much bulk or weight to the device. 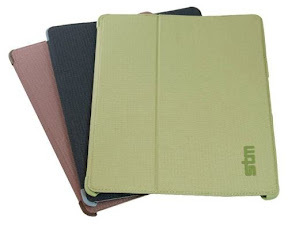 The STM Skinny from Radtech gives you both; it protects your iPad 2 all round, but its beautifully thin and lightweight material means it won’t add too much bulk. 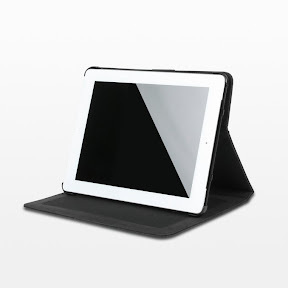 It’s firm hard shell back means you won’t have to worry about bumps and scratches to the aluminum casing of your iPad 2. It’s available in three colors and is made from water resistant micro ripstop polyester with a micro suede lining. The Octavo from Pad and Quill is a beautiful case that disguises your iPad 2 as a fancy leather book. 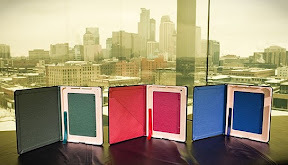 It comes in three different interior colors, and hold the iPad 2 firmly in place with a soft bumper. A ribbon bookmark holds the case shut tight when not in use. There are port holes all around the case for access to the dock connector, wake button, switch, and volume controls. The Folio 360 II from The Joy Factory is a sleek, sophisticated and subtle leather case for someone who wants their iPad to look nothing more than professional. Open the case up into a stand with a range of viewing angles from 90-165 degrees with a non-slip design that’s comfortable for typing, reading, and even gaming. The Folio’s most unique feature is the ability to rotate your device within the case to use in both portrait and landscape mode – a feature I haven’t seen in an iPad case before. For me, the Miniot Cover is the most impressive third-party cover to hit the shelves so far. It’s made from a single piece of cherrywood and works in exactly the same way as Apple’s Smart Cover. The only difference is that it rolls up into a loop when you open it up, as opposed to a triangle. Despite this, it still functions perfectly well as a stand. You can get your Miniot Cover engraved with a personal message.